For the past few years during the Holy Week, the church would have Stations of the Cross. This year we had Bible Reading Vigil instead. It started on Good Friday; after the Good Friday Service at 7.30pm and ends at before Easter service at 8.00 am. As usual, such activity is held at the Youth Center. There are helpers who keep the place in order and also to coordinate the flow of the reading. A week before the vigil, the MYFers and some of the adults cleaned up the Youth Center. So all of us have to remove our shoes to walk in the sparklingly clean floor. Each reader is given a 15 minute slot. Of course those who want to read longer can do so. 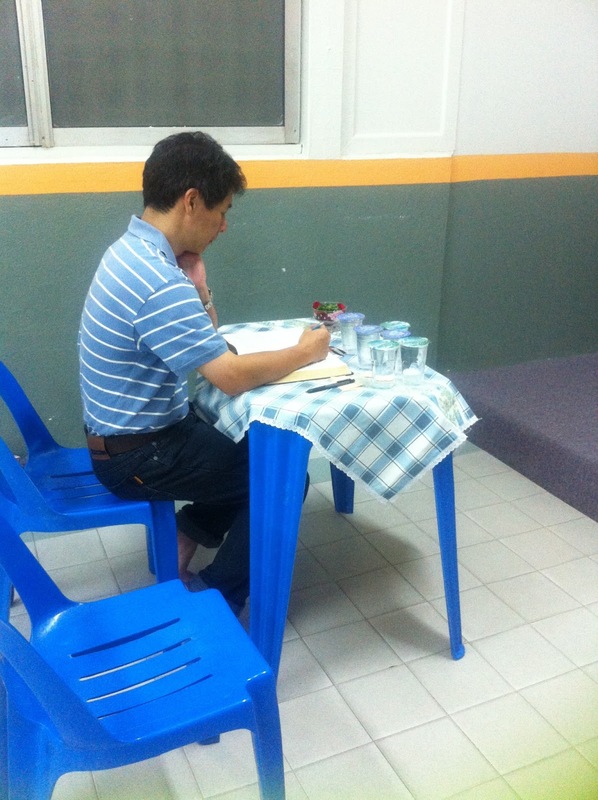 Before their turn to read, the reader will sit at waiting table to follow the reading that is done by the reader. Both the Bibles used at the reading and at the waiting table are the same translation with big prints. A few minutes before the time, the helper will remind the person waiting to read to wait next/behind the reader so the reader knows his time is up. 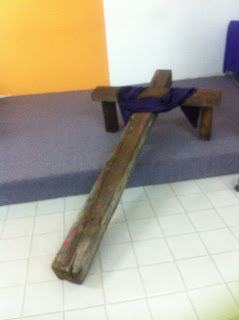 The wooden cross that has been used for all the stations of the cross is used to decorate the Youth Center....a reminder to all of us that it's all about the cross. 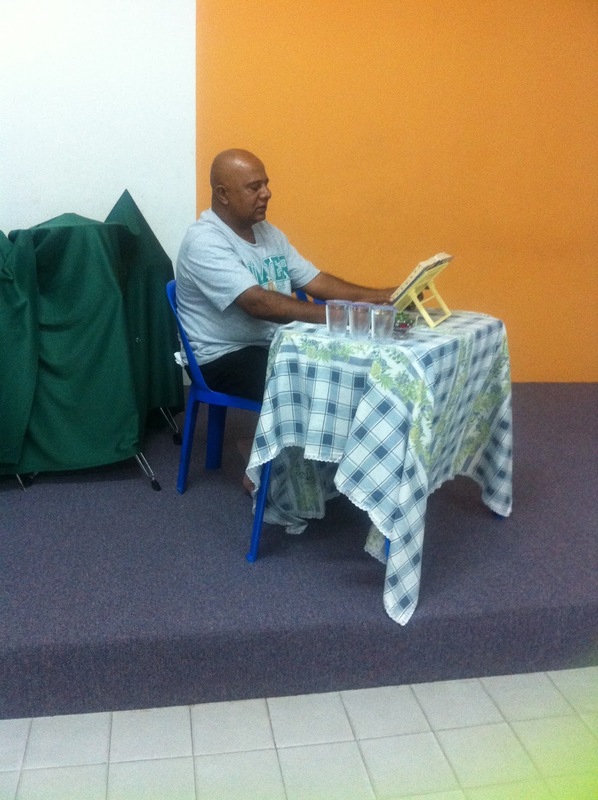 The reader reads aloud the Bible passage for 15minutes. We started off with the book of Isaiah. 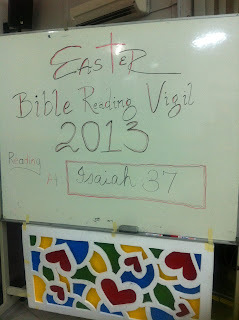 The roster showing the readers on Good Friday. There is another list to show the helpers during this time. Helpers also do the reading when the reading slots are not filled in. For eg, this morning during the 6.00 - 8.00 am slot, we were short of readers. So those of us who were helpers; Mr Hunt, Jamie and I took turns to read. There is also those who volunteer to stay over in the Youth Center through Friday and Saturday night. Friday night was Pastor and family with Lyn...Dan had to pull out from it. 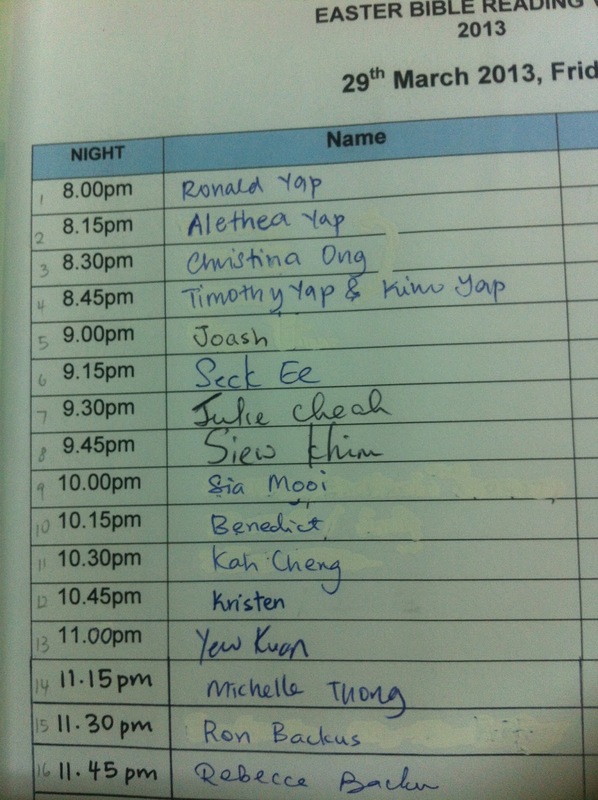 Tonight will be Ben and family (minus Joash who has just left for NS) and some of the MYFers. It was a very good experience and really not an easy task for me as Dan was admitted to hospital on Maundy Thursday. But the challenge and the sacrifice made to keep the appointed time to help and read was a reminder of what my Saviour had done for me and much much more to my little inconvenience. Blessed Easter!! Of course the tomb of Sir Francis Light is a must see. We zoomed straight in search of this tomb first. See how ancient it is....I guess this is the very thing that makes us excited. To know we are walking where the ancient people walked years ago. And it's most interesting that Lyn has such great interest in such history relics as I do. This is Thomas Leonowen's tomb....when we saw his name on the board at the entrance we were so excited because of who the wife was....Anna Leonowens; the governess to King Mongkut's children. An old building which we passed by...made into heritage site also. Think belongs to Kedah royalty. One of the highlights of the walk was looking for murals. This is one of the better preserved murals. Most of the murals have faded. We took a short cut using a back lane and passed through real old and rundown buildings like this. Root has grown into the building. We also saw a drug addict sitting at the back of some shops. This is at Love Lane....where is my husband??? Real cute. Any relations to the Lims that I know in Seremban? These bikes are for rent! Dan was so tired that he wanted us to rent a bike to cycle around. Come to think of it, he didn't enjoy the walk as much as we did... I think his stomach was bothering him and he just kept quiet. This is at Jalan Ah Kwee....The Mat Salleh trying to get the name Ah Kwee correct. Hah...this is faded. It's a boy riding a motorbike (clear) and chased by a smaller boy and a dinosaur (almost gone). I love this. So so cute. I was in the toilet just behind the wall and could hear people shouting across the road telling the friends how to post etc with the mural. While waiting for our turn to post at the mural, we saw this cute dog. He is carrying his own bag...probably his drinks and food. Really obedient and well trained. This is a shop of antiquities. The man outside is playing an old chinese musical instrument. Trishaw...the mode of transport those days. I thought of getting on a trishaw for a ride but Lyn refused to. She felt it was wrong to make an old man carry her around town even though it's giving him business. Another interesting thing when we walked around town was looking at signs like this which explains to us the origins of the name of the streets. Like this is Jalan Soo Hong...the smallest street in town. Anyway.....every other street seemed to be named after some rich chinese business man. Potholes....trishaw driver fell into a pothole. Khoo Kongsi...such an illustrious family and able to trace the family tree way back to China. Impressive. Dan is in the hospital for appendicitis. He has been complaining of tummy pain past week and I just took if for gas. He always has tummy pain. I promised to bring him to the doctor when we returned from Penang. Yesterday evening he was supposed to have tuition but he put on a sad face and said tummy pain. He doesn't really like going for tuition so I took it as excuse to avoid tuition. After a while he still looked pained....I decided to put a stop to this tummy pain issue. Told him we would go to a doctor and have him checked. The doctor I wanted him to see wasn't open. The next clinic...too difficult to turn into that road. So decided on the third clinic...not sure about this doctor...how good he is. He is an old man...sounds bit foreign; Pakistani I think. Checked, pressed etc and said appendix. Wanted me to check him into hospital immediately. Wrote me a referral letter. Anyway, before the surgeon touched him, he was touched by another doctor. So the surgeon was the third doctor to touch Dan. His magical press clinically proved that Dan has appendix and need to remove it. Waiting for an ultra sound scan now and later the doc will check Dan again. Pastor introduced this place to us. The owner is from his church; Penang Wesley. He insisted that we must try it out. So after going up Penang Hill, we did not stop at any hawker centers though they were so tempting. We saved our stomach for this place. The menu is on the board. We have to look up to see what we want. The place was packed. We couldn't find a place to sit at first. Most of the people are youngsters. I guess this is their type of food. The fries in barbeque sauce. Fries are thick slices of potatoes. Very satisfying biting into them. We also ordered onion rings which are equally good. There is all kinds of burger...bison, bull, boar, piggy, chicken, fish etc with strips of bacon and extra cheese if you want. Dan was greedy and ordered boar...which is double of everything!!! The owner made his own patties from imported meat (so Pastor told us). And as you can see, the price is really reasonable. Boar (which is actually a double meat burger) is only RM16+. This was my burger..forgotten what it was. All I remembered was it was so difficult to hold and eat. Meat and bacon was slipping off. The taste really good and the patty was really thick. I've not tasted burger as good as this anywhere in Malaysia. The ambience....totally packed. People just kept coming in and it was already past 8pm. The shop is actually quite narrow. KC thinks it's good marketing strategy to use a narrow lot and not expand it so people can see how crowded it is. Where there is a crowd, the food is most likely to be good (this is our principle when we look for food). Outside the shop...Marshall's. It's along Jalan Burma....near Penang Wesley Church. We parked near Penang Plaza and walked across to the restaurant. Am looking forward to Penang again to eat this burger....a must for everybody who visits Penang. (it's non-halal). To discover a place you need to walk and walk and walk. We were almost tempted to drive around the streets of Penang in our car but decided to act like proper tourists. So while walking we discovered this real quaint place by the lorong which serves coffee, toasts and eggs...the old fashioned way. The eggs...well done. Not watery. Really good. The toast....my only complain is they could have been more generous with the butter and kaya. We saw a picture of this VVIP eating toast at this kopitiam too!! This is how it looks like inside....it's actually a side shop with a little lane. Chairs and tables are placed along this lane. We really bumped into it quite by accident. How to locate it....it's opposite a dental clinic as shown in the picture above. The name is Toh Soon Cafe but can't see it from the main road. The road....it's somewhere along Campbell Street. That's the interesting part about being a tourist...discovering places as we go along. Eating is of major concern for us in Penang. The first place to attack is the hawker center to try out all the hawker food that we liked. The next day, we visited Suffolk Home with Pastor's family. After touring the house, we had tea. It was a very English tea indeed. English tea is not tea without tea. A variety of tea to choose from. Scones...real crumbly. This is the best scones I've ever tasted. Tried quite a few from various places and this is the best. Two types of cakes....banana and fruit cake. Along with the scones and cakes are some sandwiches, biscuits and also chicken pies. Of course a variety of jam to go with the scones. Pretty nice actually though expensive. A set for two is RM68...we ordered two sets for eight of us. It was just nice...no over eating. Later that night after visiting USM, we brought Pastor and family to our favourite nasi kandar at Glugor. The queue was long....almost 30 people were lining up. Had been like this 20 years ago when we were students. A great variety to choose from but the dishes were almost gone. I had ayam kandar, telur dadar, sotong and beans for only RM7. Dirt cheap after Suffolk!!! A most satisfying meal and Pastor agreed with us it is the best nasi kandar in Penang. Delicious and cheap. Finally the time came for us to visit Penang again. The last time we visited was almost five years ago and the children couldn't remember much. We didn't do much except stayed at G Hotel and watched two movies and walked the shopping complex as KC was attending a function. This holiday was a real holiday. We put on our tourist hats and acted like tourists should. Our first stop was to visit Pastor and Gladys and the boys. Gladys suggested that we visit E n O. She thinks I would appreciate old buildings of such kind. 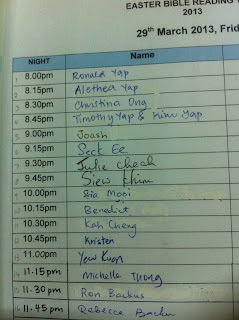 We've been to E n O as students for Yee Fong's birthday bash. We went ballroom dancing after the makan. But it was good to get get acquainted with it again and to see wings named after people I know like Somerset Maugham, Rudyard Kipling. Being thick skinned....we explored as much as we could. These three men with handle bar moustache....according to Pastor, they are the Sarkies brothers who started the hotel. Need to check the fact. We took the staircase up to visit the different floors. The boys were making so much noise running ahead that we had to shush them. The corridors to the rooms are really wide and the floor is solid wood. Very impressive structure. At the lobby there is a dome which sort of carry the voices of the people. Again we tested out the 'sound system' here. Then Gladys and Lyn spotted a white grand piano. Being crazy musicians, they just had to show off their talents till the staff came to lock it. The view outside the hotel. The boys as usual ran around and everywhere. The next day we walked to Taman Negara....it's actually Monkey Beach/ Muka Head etc. Now it's known as Taman Negara. We used to hike here as students. Lovely lovely walk in but we didn't reach our destination. The sights were lovely and we took time to enjoy God's creation and took pictures. This rope kept us occupied a while as we tried swinging with it. We started coming out after an hour walking as some of us were already tired. Later in the evening we met up with Pastor and family again and took a walk down memory lane....USM. It was also Gladys' alma-mater. We had a great time walking around campus...visiting the DTSP, library and talking about where we frequented, what we did etc. KC was 'emo-ing' over his school. He took the children in the building to show where the rubber workshop was....it was no longer there. Lots of changes. He was pretty emotional over the whole place....I was ok la.